Modern girls pageant shoes Kayla 150 by Touch Ups. A little girl can wear modern shoes without losing her innocence and this is the way to prove.. 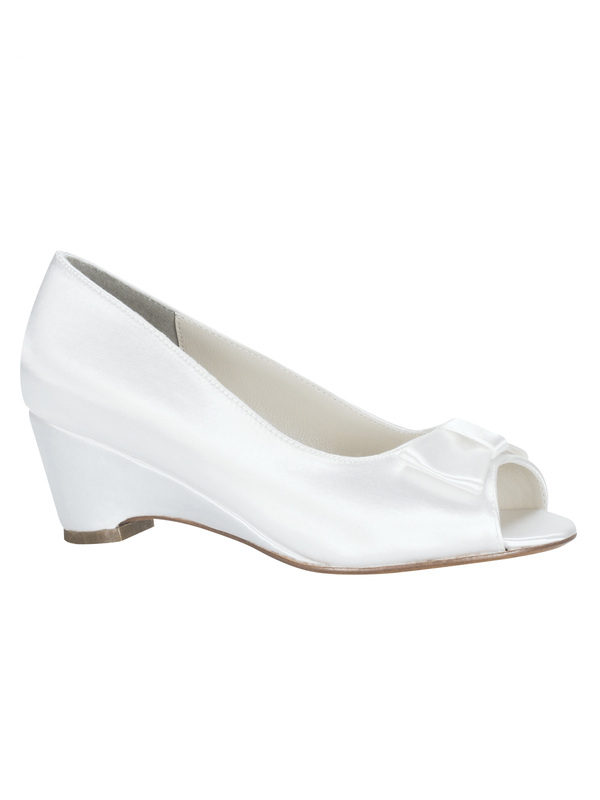 The I ¼' angle heel has a wedge design to get that groovy comfortable style. Satin material shines with the dress and an open toe is the contemporary touch with a bow detail. Available in White. TRUE FIT GUARANTEE FEE Our products will fit you perfectly, or we'll exchange them at no additional cost to you! We'll pay all the shipping costs! We'll ship the replacement immediately. NOTE: Claims must be made within 3 days of receipt. Shoes MUST BE returned in original shoe box in new condition to qualify for exchange. Item can only be exchanged for a different size of the same model. Modern girls pageant shoes Kayla 150 by Touch Ups. A little girl can wear modern shoes without losing her innocence and this is the way to prove.. The I ¼' angle heel has a wedge design to get that groovy comfortable style. Satin material shines with the dress and an open toe is the contemporary touch with a bow detail. Available in White.